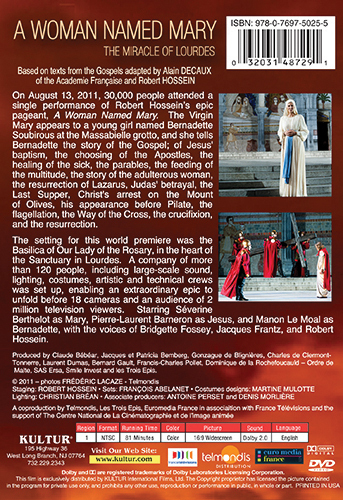 On August 13th, 2011, 30,000 people attended a single performance of Robert Hossein’s epic pageant, A Woman Named Mary. The Virgin Mary appears to a young girl named Bernadette Soubirous at the Massabielle grotto, and she tells Bernadette the story of the Gospel; of Jesus' baptism, the choosing of the Apostles, the healing of the sick, the parables, the feeding of the multitude, the story of the adulterous woman, the resurrection of Lazarus, Judas' betrayal, the Last Supper, Christ's arrest on the Mount of Olives, his appearance before Pilate, the flagellation, the Way of the Cross, the crucifixion, and the resurrection. 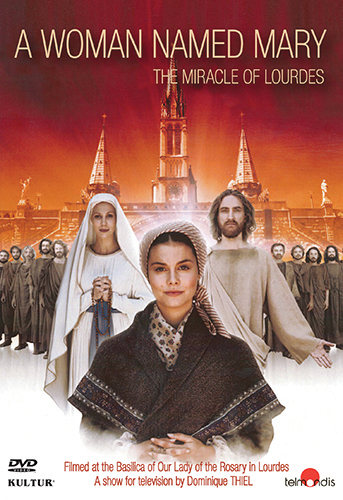 The setting for this world premiere was the Basilica of Our Lady of the Rosary, in the heart of the Sanctuary in Lourdes. A company of more than 120 people, including large-scale sound, lighting, costumes, artistic and technical crews was set up, enabling an extraordinary epic to unfold before 18 cameras and an audience of 2 million television viewers. Starring Séverine Berthelot as Mary, Pierre-Laurent Barneron as Jesus, and Manon Le Moal as Bernadette, with the voices of Bridgette Fossey, Jacques Frantz, and Robert Hossein.